Boston College quarterback Tyler Murphy rushed for 191 yards, breaking free for a 66-yard touchdown on Saturday night as Boston College beat No. 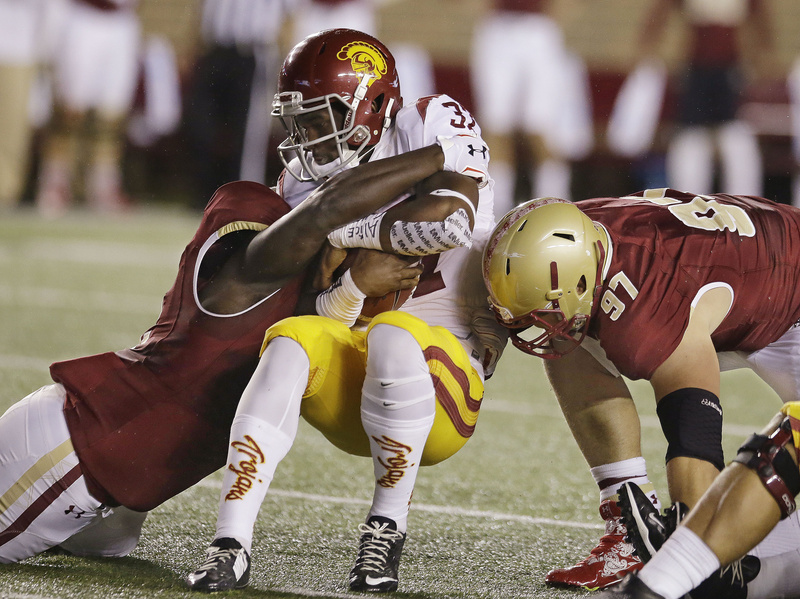 9 Southern California 37-31 in Boston – the Eagles’ first victory over a top 10 team in a decade. Jon Hilliman ran for 89 yards and two TDs and Myles Willis and receiver Sherman Alston each broke off runs of 50-plus yards to help BC (2-1) amass 464 rushing yards. USC (2-1) was coming off an emotional victory over Pac-12 rival Stanford that moved the Trojans up five spots in the AP’s Top 25. Cody Kessler completed 31 of 41 passes for 317 yards and four TDs, but he was also sacked five times. (2) Oregon 48, Wyoming 14: Marcus Mariota passed for 221 yards and two TDs and ran for two more scores and the Ducks (3-0) survived a slow start to fly away from the Cowboys (2-1) in Eugene. Oregon erased a 7-0 deficit with four second-quarter TDs to take command. Mariota became the fourth Oregon quarterback to pass for more than 7,000 yards. The Ducks junior completed 19 of 23 passes and also rushed five times for 71 yards, including TD runs of 15 and 19 yards. Mariota has thrown a school-record 71 TDs, with at least one thrown in all 29 games he’s appeared in. (12) UCLA 20, Texas 17: UCLA backup QB Jerry Neuheisel threw two TD passes, including a 33-yarder to Jordan Payton with 3 minutes left, and the Bruins (3-0) avoided an upset with a win over the scuffling Longhorns (1-2) in Arlington, Texas. The go-ahead score for the Bruins came on the first play after Ishmael Adams’ 58-yard punt return. Neuheisel completed 23 of 30 passes for 178 yards after Brett Hundley injured his left elbow in the first quarter. (15) Stanford 35, Army 0: Kevin Hogan threw for 216 yards and four TDs and the Cardinal (2-1) hit on all cylinders in a victory over the Black Knights (1-1) in Stanford, California. Devon Cajuste had a career-high three TD receptions and Ty Montgomery rushed for a pair of scores in the fourth quarter for Stanford. (16) Arizona State 38, Colorado 24: Taylor Kelly threw three TD passes and ran 50 yards for another score before leaving with a right foot injury, and the Sun Devils (3-0, 1-0 Pac-12) withstood a late challenge to beat the Buffaloes (1-2, 0-1) in Boulder, Colorado. D.J Foster also had a big night for ASU rushing 20 times for 147 yards, including a 15-yard TD. He also had a 5-yard scoring catch. Arizona 35, Nevada 28: Anu Solomon threw for 278 yards and three TDs, Nick Wilson ran for 171 yards and the Wildcats (3-0) held off the Wolf Pack (2-1) in Tucson, Arizona. Wilson ran for a pair of TDs and gave Arizona a 100-yard rusher for the 20th straight game, tied for longest in the FBS since 1996. Solomon finished 22 of 26 passing and threw two second-half scoring passes to Cayleb Jones, who had nine catches for 116 yards. Cody Fajardo kept Nevada in it, throwing for 321 yards and three TDs.